Cojedes State has a tricolor of the same proportions as the classical Miranda tricolor (three stripes, wider as the go up). The first stripe, on naples yellow, houses a black circle wherewhich a naples yellow sun, of sixteen irregular (as the model I saw) rays, glow. The following stripes are black, and blue. The Cojedes State Flag - Attributes and Meaning : Cojedes is a central-western state of Venezuela and its flag is divided on three horizontal stripes. The orange stripe which occupied 4/6 parts of the field, is a combination of the values represented by the colors yellow and red: the region ground richness, the purity, the people faith, the constancy, the strength, the courage, the valor and the intrepidity of the heroes which leaked their blood on these land and the historical facts that happens there. The black stripe is occupied 1/6 part under the orange stripe and symbolizes the ferreous temper of the metal, the science, the industry and the fortitude to the Cojedenians, as remind of the laborious pledge of their ancestors. It also represents too the tenacity and spiritual values of the people and besides, their effort for the conservation and multiplication of the natural wealth of the state. The blue stripe which complete the remaining sixth and the same colored circle symbolizes the realism, the majesty and the beauty, while it represents the firmament covering that covers the Cojedenian land and the characteristic values of its stock. At the same time, reminds the water in time of abundance alluding to the generosity of the hydrological sources of the State that do not only calm thirst, but the one from the region to which belong. The yellow gold sun remembers the heroic gest of the Battle of Taguanes in 1813 and the preparations of the Battle of Carabobo in 1821: its aglow rays evoke the lances of the "llaneros" (Venezuelan plain men) of the emancipation war and the flaming rays remember the patriotic fire that burned and will burn in the heart of the Cojedenian people. Historical Synthesis: The Cojedenian flag was designed by the Professor Pedro Gramcko and it was approved on April 3rd, 1997 by the Special Commission designated to the effects by Mr. Alberto Gal�ndez, Governor of the State, by means of the Decree N� 300 on February 28th,1997. The Cojedenian CoA - According to the investigator and Chronicler of San Carlos' City - capital of the State- Jose' Antonio Borjas; the Professor Adolfo Salazar Quijada and other historians, the name of the Cojedes State that was attributed to the river of the same name, has Caribbean origin and it comes from two words: "COA" that means "people", "nation" and "HERI" which is equal to say "cooked pots", from which one can deduce that Cojedes, in the natives' tongue of the Caribbean family, means "ceramic people". Probably, this name remembers a human group that inhabited the region and that manufactured pots or ceramic recipients. From the original name "Coaheri", was derived the names "Coxedes", "Cogede", until becoming the current name "Cojedes". The Cojedenian Coat of Arms, created by Decree of the Regional Executive on January 1st, 1910, consists on a circular seal with a simple field enameled on azure (blue) where appears a semblance of the predominant landscape in the region. On the fine carpet of the "llanos" (the Venezuelan plains) groups of palms and diverse trees stand out on intervals for reveal the fecundity of the Cojedenian ground. Crossing on counterbend (from the sinister to the dexter of the shield) its shows an undulant silver tape that represents a navigable river for where the force that impels the trade of the federal entity circulates. There, a magnificent black bull with the horns and hooves in gold, stands out on its foot for dominates with their look the immensity of the llanos, to symbolize the prosperity of the cattle raising: main source of the wealth of the Cojedes State. On direction to the upper dexter canton and over the horizon, two white herons lift the flight in the face of the first radiances of the dawn, while on the upper sinister canton it stands out the constellation of Orion which dominates the Venezuelan and Cojedenian sky the most part of the year, to represent the heroes of this land that contributed with their courage and with their blood to forge the destiny of Venezuela. 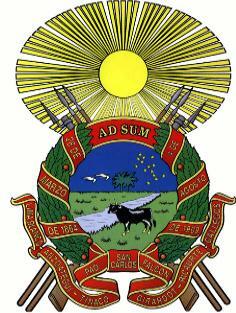 As external ornaments, the shield presents a resplendent sun like a cimier, symbol of Glory, which illuminates the Latin war cry "AD SUM" (I am Present) as timmer, that represents the attitude of the Cojedenians in front of the history: ready and sign to spill its blood Iike yesterday to defend the causes of the Right and of the Freedom. The laurel crown that surrounds the field as a border and the war trophies, four lances and two rifles with soaked bayonets crosses on saltire behind the shield, symbolizes the victories that the Cojedenians reached in the fight for the national emancipation. The scarlet pennants that wrap the crown and hold it under the shield, presents like mottoes the ephemeris "28 de Marzo de 1864" (March 28th, 1864), date when the Federal Constitution of Venezuela was sanctioned and "4 de Agosto de 1909" (August 4th, 1909), date of the creation of the State and also, the names of the municipalities that integrate it "LIMA BLANCO", "ANZOATEGUI", "TINACO", "PAO","SAN CARLOS", "FALCON", "GIRARDOT", "RICAURTE" and "GALLEGOS". The Flag, the Coat of Arms and the Anthem of this federal entity have been officially adopted by means of the Law of Symbols of the Cojedes State, sanctioned by the Legislative Assembly on July 30th, 1997 and published in the Official Gazette of the Cojedes State No. 23 (Extraordinary) of the same date. Sources: - Law of Symbols of the Cojedes State, Official Gazette of the Cojedes State No. 23 (Extraordinary), July 30th, 1997. - Los Simbolos Sagrados de la Nacion Venezolana (The Sacred Symbols of the Venezuelan Nation) by Francisco Alejandro Vargas, 1981.